Two layers of next-generation clear protection now with glitter. Patented design provides two layers of protection. Certified to meet or exceed MIL-STD-810G drop test standards. Custom engineered soft acrylic absorbs shock. Exterior polycarbonate layer disperses impact. Glitter is embedded in the case and won’t rub or scratch off over time. Patented design provides two layers of protection. Exterior polycarbonate layer disperses impact while interior custom engineered soft acrylic layer absorbs shock. Resists UV yellowing over time. Bezel rises above screen to guard glass from direct drops onto phone face and prevents screen from scratching when laying flat. 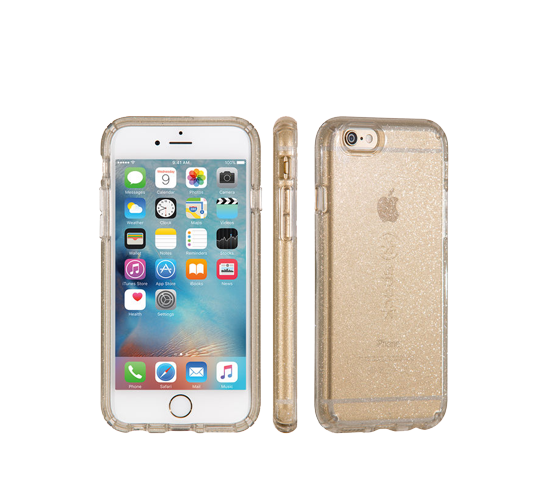 CandyShell Clear with Glitter protects your iPhone 6s/6 without adding unnecessary bulk. Custom engineered soft acrylic liner protects ports from drops without compromising sound or photo quality. Glitter won’t drain your battery or interfere with signal strength. Durability and accelerated life tested against extreme temperatures, cracks, and abrasions. Rubberised covers shield volume and power buttons while keeping them fully accessible.